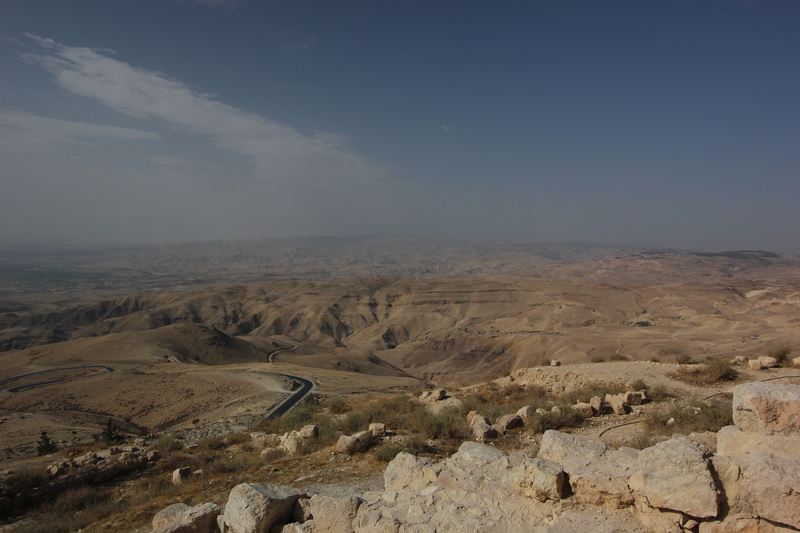 We had to drive up and down a small mountain to get to Bethany-Beyond-Jordan from Mt. Nebo. It was all desert, without much to see but rocks, sand, and more rocks. I never knew barren land could be so beautiful, and the experience was made much more surreal when the taxi driver played PSY’s Gangnam style from his MP3 Player. What a strange juxtaposition. We got to the Bethany-Beyond-Jordan, only to find it closed 7 minutes ago. Apparently you would have to take a shuttle bus for 10 minutes from the ticket office, and need a guide accompanying you in the site. Unfortunately all the drivers have now gone home – the ticket officer tells me. The taxi driver steps in and has a slightly heated conversation with the ticket officer in Arabic. The only words I can understand is ‘Korea! Korea!’. I guess he’s telling him that I’m all the way from Korea. I actually live in the UK but keep my mouth shut. Finally the ticket officer gives in and makes a phone call to make a special arrangement with the security soldiers to let our taxi into the site (security is tight near the Bethany Beyond Jordan because it is right next to the border with Israel), and a tall man comes with us to show me around the site. I smile and thank him for his time, but he just walks past me without making any eye contact. At that time I thought he was angry at me for the trouble I caused, but now I think he was being a little shy. I was expecting the site to be a small shrine near the River Jordan, taking about 10 minutes to have a look. It turns it is quite a trek, following a little foot path amidst dried up trees and grass. The guide doesn’t speak much English so our conversations were made up of short simple words. ‘Church, Catholic’. He points to one church. ‘Church, Orthodox’. He points to another church. The site has a number of significant places such as Tell Elias (where Elijah is said to have ascended to heaven) and a hermit cave, but they all seem to be closed and I couldn’t ask him to take me to those places, as I was feeling already too bad for taking up his time. The actual baptism site is also made up of several ruins, and my Lonely Planet book wasn’t very clear which ruin was which. It was slightly disappointing that I only get a brief glimpse of the place that holds such a personal significance, but at the same time I was grateful that I got to have a look at the site at all. The guide teaches me a few Arabic words, and that’s what we keep on saying throughout our 45 minute walk around the site. ‘Yallah (Come)’. ‘Tamam! (Good!)’. ‘Shukran (Thank you)’. After the tour, we get into our taxi to come back to where the information centre is. The taxi guide gets out the car with a brief goodbye, without even hinting for a tip. I hurriedly follow after him and shake his hand with a very sincere ‘Shukran’.